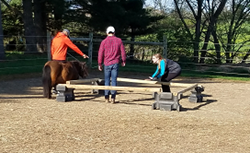 Two groups of people at different stages of their careers had the opportunity to gain insight into the importance of building relationships and clear communication to achieve desired outcomes through a unique hands-on learning experience with horses. Members of the Ohio Association of Realtors as well as students from Ashland University recently participated in the Wager’s Way Equine Assisted Action Learning program where they engaged in ground-based activities with horses to gain self-awareness of their leadership styles and capabilities, the importance of clear communication and how to overcome challenges to goals. Participants in this experiential learning program also had the opportunity to learn about self-imposed limitations that may interfere with achieving goals. The Ohio Association of Realtors completed a mini-workshop with the Wager’s Way team as part of their annual meeting which was hosted by JC Meyer/Howard Hanna Realtor Tiffany Meyer at her farm in Ashland, Ohio. The realtors who participated in the exercise were challenged with moving three horses - who represented clients - to a specified area without touching the horses or using any type of equipment meant to help guide and direct the horses. Take-aways included: Being open to listening to what clients need and taking time to build relationship with them; Understanding that clients don’t have the same amount of information as the realtors so it’s important to communicate in a way that helps them understand the process; and building relationships with clients may mean learning to understand cultural differences. Wager’s Way Equine Assisted Action Learning, based out of Ashland, Ohio, is an experiential leadership and team development program offering organizations and individuals the opportunity to gain skills that can increase success across a broad range of challenges. The professional facilitators guide participants through a proven process that takes the experience with the horses and applies it to a context which provides participants with the opportunity to see where else those challenges may be happening for them and determine action steps to move forward. Wager’s Way Founder and President, Ginny Telego, is an Advanced Certified Practitioner and Master Trainer with the Equine Experiential Education Associations (E3A). She and her co-facilitator, Carole Trimble, are available to provide workshops both at the Ashland, Ohio facility as well as off-site. For more information, visit http://www.wagersway.com or contact Ginny Telego at 419-651-6854.